Posing the question ‘What did you watch on TV when you were a child?’ to Veronica (50) and Peter (54), I was not expecting to write down too much. After all, how much variety could there have been when only a meagre number of channels existed compared to the 200+ available on Foxtel today? Yet in a matter of seconds, I found myself furiously scribbling away, trying to keep up with the endless names of shows rattling off their tongues: Hogan’s Heroes, The Beverly Hillbillies, Gilligan’s Island, Lost in Space, Get Smart, Skippy the Bush Kangaroo, The Brady Bunch, Bewitched, The Partridge Family, Fawlty Towers, Romper Room, I Dream of Jeannie, The Wonderful World of Disney on Sunday nights…and the list went on. Indeed, there were a number of surprising elements to my interview with Veronica and Peter about their childhood memories of television. The idea of watching I Dream of Jeannie in black and white (how could you tell that Jeannie’s evil twin sister wears green? ), owning televisions that were pieces of furniture in their own right, large enough to display the family heirlooms on their surface, and test patterns that appeared when stations “signed off” at the end of the night all seem rather incredulous in today’s 24/7 digital environment where wall-sized, paper-thin flat screen TVs with high-definition are the standard. In addition to these technological changes, the interview with Veronica and Peter also provided a fascinating insight into the way television created and shaped the routines, rituals and social life of families during the 1960s and 70s. Bible Study meant no TV so we had to go to bed early – it sucked! I remember getting our first colour TV…I watched it for three days straight and ended up with sore eyes. 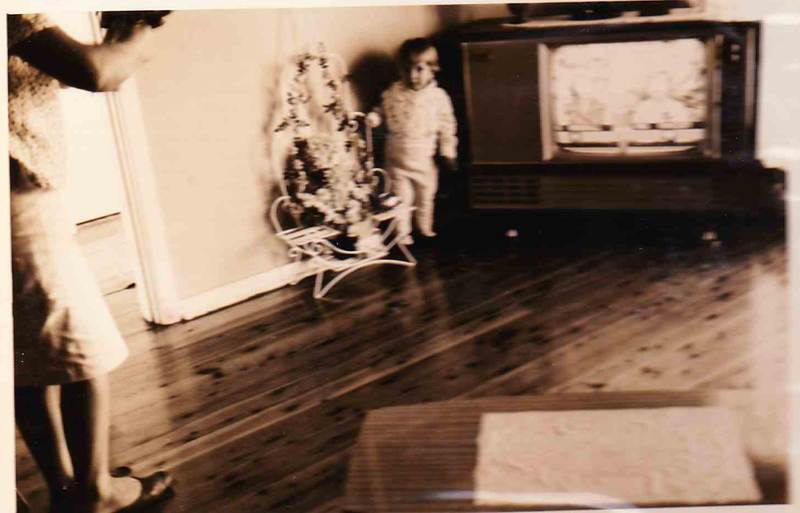 A young Veronica stands next to the family’s first TV set. We could watch TV during dinner…as long as we would eat. My mum always kept a look out for a man who would be knocking from door to door checking people’s television licenses. I remember there was always a fear that he would turn up. “You not only had to buy the TV, but you also needed a license to watch it!” recalls Veronica. Not only do these memories provide an interesting insight into a different time and space, they also help to paint a picture of two very different suburban households in which television played a central role. It has become evident that individuals can have very diverse experiences of television in terms of how the medium is incorporated into their domestic space, daily routines and family relationships. The particular character of a household, including distinctions of class, ethnicity, religious identity and so on, inform and define the conditions for television’s appropriation into the home and its domestic culture. This results in private, personal meanings, as in the everyday stories of Veronica and Peter, but also broader cultural meanings that extend the boundaries of the home and are recognised as shared experiences. Veronica and Peter, despite differences in their childhood environments, enjoyed watching the same programmes that now provide a shared sense of the past. It is, thus, important to understand television’s influence and significance in society and culture in terms of our own individual upbringings as well as in the communal identity rooted in generations who can identify together due to the shareable world of television. Drumroll!!! The 1970s opening theme song to the Wonderful World of Disney. I wonder what is install tonight…could it be Fantasy Land, or maybe Adventure Land, perhaps Frontier Land or could it be Tomorrow Land? The not-so-exciting ABC’s test pattern from 1975. Good try though with the disco music, ABC! This entry was posted in Media, Audience, Place and tagged children, interview, television. Bookmark the permalink.